One of the things I miss most about my hometown is the food. Populated by descendants of European immigrants brought to the anthracite area of Pennsylvania as cheap labor for the booming coal industry in the late 1800’s – early 1900’s, the Wyoming Valley is rich in ethnic heritage and the most wonderful foods you can imagine. These simple peasant dishes will not be found in any fine restaurant, but families still gather to make and feast on recipes that traveled from Europe and have been handed down for generations. These are the tastiest vegan burgers ever — on a bun with your favorite toppings or as a substitute for chopped sirloin with mushroom gravy. This recipe makes a lot so you can freeze some for another time. The recipe comes from my niece (a wonderful cook just like her mother) who got it from the restaurant where she first enjoyed them. I veganized it. Let mixture sit for 20 minutes. Form into patties (slightly wet hands so they don’t stick) and brown in olive oil. Then add 2 cups of water with enough soy sauce or Bragg’s Liquid Aminos (about 3 Tbs) to taste. Pour this over the burgers and simmer uncovered until liquid is absorbed, turning once or twice. Enjoy! Saute together: 6 oz. chopped Portobello mushrooms, 1 lg. onion, and 2 Tbs. Annie’s Organic Worsteshire Sauce. Mix all ingredients together in a large bowl and season to taste with sea salt and cayenne pepper. Mix all together and season with sea salt and pepper as desired. (Dealing with a whole head of CABBAGE can be intimidating — don’t worry, you will win). Core the cabbage and submerge the whole thing in a large pot of boiling water. It will be somewhat bouyant so you will want to turn it occasionally so that the leaves soften evenly. Cook until the outer leaves become tender, then you can start to peel the leaves off one at a time, and place them on a clean towel to drain. (You can take the cabbage head out of the water to do this, then return it to the water to cook a little while longer until more leaves can be removed.) Repeat until all leaves are removed. When cabbage leaves are cool enough to handle: In each leaf place 2 – 3 heaping Tbs.filling, tuck in sides and roll to cover filling. 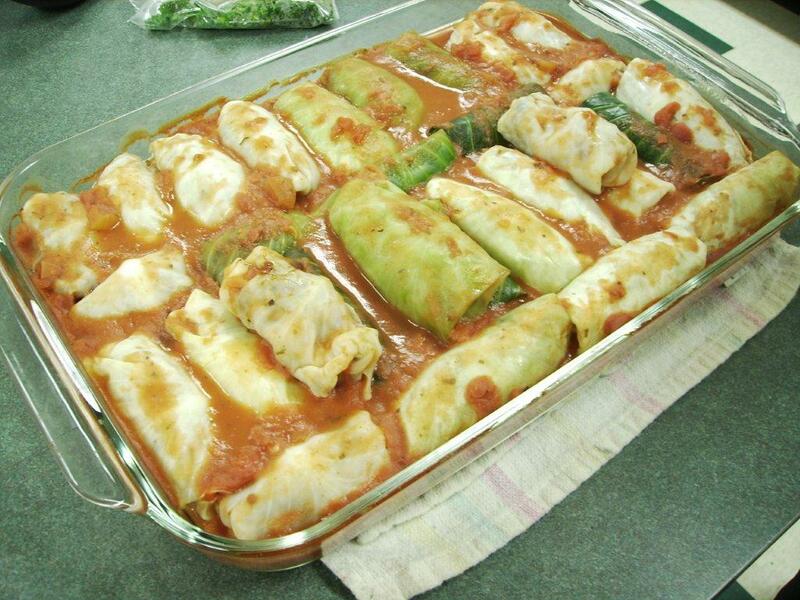 Place cabbage rolls in a large oblong glass baking dish (seam side down). Pack them tightly together so they don’t unroll. Pour sauce over all the rolls and cover with aluminum foil. Bake @ 375 degrees for 45 minutes, or until easily pierced with a fork. This recipe makes a lot (about 30 cabbage rolls). Posted on February 28, 2012 by vegtutorPosted in Miscellaneous, RecipesTagged entree, Golumpki, Halupki, oat burger, PA, Pig-in-a-Blanket, Polish, Stuffed Cabbage, vegan. Previous Previous post: Do You Want a Whole Foods Market in the Reading Area? O.M.G. The vegan oat burgers are to die for! I started the recipe tonight so I could make the golumpki tomorrow–I’m going to have to make another batch tomorrow! My meat-loving hubby devoured the burgers! LOL. Thank you so much for the recipe. I’ve been trying to eat vegan, and this recipe is a KEEPER. I love you. :o) I can’t wait to eat the whole meal deal! I do think this is the best vegan burger recipe there is. Hope you enjoy the golumpki as much! I just found this recipe after recently deciding to go vegan, and I’m so glad that I can enjoy this staple food of my Polish heritage – meatless style! I do like oat burgers, but I have another recipe for veggie burgers that I have had raving reviews of. 2 cups lentils prepared in chicken broth or stock, 2 cups steamed eggplant, 1 cup cooked rice (or another grain), and any herbs and spices blended in a food processor. Can be baked, sauteed, fried, or even eaten “raw” like refried beans. Best if left overnight before eating 🙂 My husband and I call it “lentil smushy” – tastes better than its name implies! I hope you try it – and enjoy it! Thanks for the golumpki recipe!! As a new vegan, you might like to try a vegan chicken broth called “No Chicken Broth” in your ‘lentil smushy.” recipe(which I will definitely make — thank you!). I use “No Chicken Broth” in any recipe that calls for chicken broth, and you can’t tell the difference. You can find it in any health food store or the organic aisle of most upscale grocery stores. I buy it in our local Giant. Yum! These were fantastic. The vegan burgers made this my best attempt at Vegan Halupki! Thank you. So, is it a total of 4 cups of rolled oats for the burgers? Do you actually fry the burgers when using them for the halupki? Yes, it is a total 4 cups oats. Fry burgers first, then cook them in the Bragg’s seasoned broth. You must do that first before stuffing the cabbage leaves for optimal flavor. The burgers are great as “hamburgers,” too!